You are here: Home / Liquor 101 / Prohibition! 1920. There are 1.8 billion people – in the entire world. Small pox is a problem for a bunch of them. In more advanced countries, we’re concerned with politics. Switzerland joins the League of Nations (no, not one with superhero tights, though that might have been fun). The United States grants women the right to vote. But first, makes all of us vote sober – by passing the 18th Amendment. Prohibition. While “legal” distilleries were outlawed, there were plenty of illegal ones. Moonshiners popped up all over the country, making ‘shine out of whatever they had on hand. Ever heard of bathtub gin? There’s a reason it’s called bathtub, and not because you could possibly end up in one after a hard night of drinking said gin. Nope, it really was made in a bathtub (either using water from the tap or actually mixed up directly in the tub). Gin, like vodka, isn’t an aged spirit – so pretty much straight from the still to the glass. Or straight from the bathtub, as the case may be. 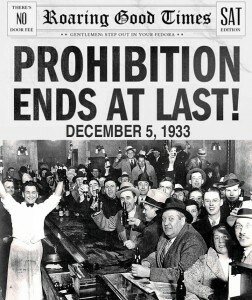 After thirteen (mostly) dry years, Prohibition was repealed. Well, mostly. There are still federal laws, along with a patchwork of various state laws that make it interesting to distill in the US. “Interesting”, as in, heavily taxed (hello, New Jersey) and often accompanied by mind-boggling amounts of permits and licenses. Ask the Internet and opinions vary on whether Prohibition actually reduced the amount of drinking during that time. Some say yes, some say no – shows like HBO’s Boardwalk Empire would lead you to believe that there was plenty of liquor to be had, for those that were interested in having it. Next time: Part Three, Craft Distilling and the future!